With this in mind, we’re excited to announce the release of customized column-based retrospectives, a highly requested customer feature! When facilitators begin a retrospective in Retrium, there’s now an option to create your own “custom” technique from the menu in the bottom right of the app. When you select this option, it will open a blank canvas, where the facilitator can start from scratch and create any columns that you would like to include in your team’s retrospective. You have the choice to label each column with whatever title you’d like. This means that Retrium can be used to gather data on any number of topics and exactly the way you want! You can mix it up and try something new to keep your retrospectives fresh and interesting. 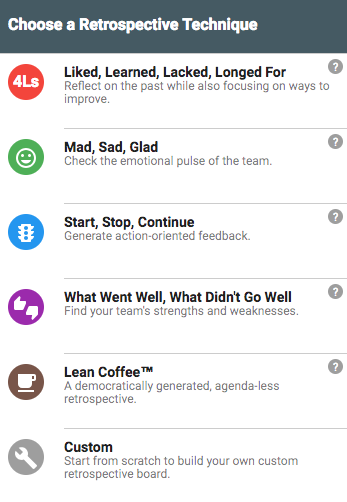 If you start with one of our standard retrospective techniques, the facilitator of your team’s retrospective can now add, remove, or rename any column during the thinking phase of your retrospective. Any new columns will be added on the right side of your screen, and you’ll be able to see the new column’s title at the top. You can then add notes within that column to share your ideas related to that item. This allows your team to use industry best practices for retrospective, while simultaneously being able to make it your own. This extends what’s currently available in any of our techniques. Try a custom retrospective today! If you have questions or feedback on this new feature, please reach out to us at support@retrium.com.